Tree stump grinding involves the use of specialised equipment. Stump grinding equipment varies in horse power, maneuverability, and dimension. Usually more horse power equates to faster stump grinding, but there is a price to pay. The price paid for higher horse power is less maneuverability and larger dimension which restricts access. The engine drives a cutting/grinding wheel, tipped with tungsten carbide teeth. Tungsten carbide teeth are used for its superior hardness and wear ability. Plain sharpened steel for an example would quickly wear and break. This is why you cannot use a chainsaw to cut away a tree stump. The cutting wheel rotates and chops away the wood of the tree stump. The higher the horse power, the more force is directed to the grinding wheel and consequently the faster and more efficient is the stump grinding job. When we come to your site for inspection and pricing we need to establish access to the stump, and consequently which machine would be most suitable for your requirements. During inspection, please inform us what your reasons for stump grinding. 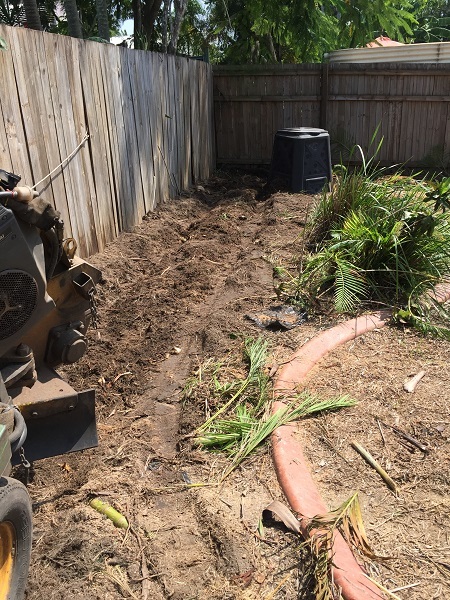 Are you removing the stump to re-turf, or to re-plant in the area, is there any construction taking place in the area, ie – concrete slabs, footings, paving, etc, or are you removing the tree stump for white ant/termite prevention? These variables determine how deep we need to stump grind. 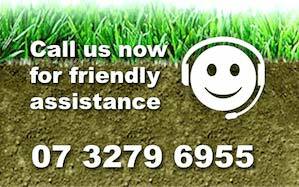 For example; turfing requires a minimum of 4 inches/100mm, or complete removal can sometimes require 1 meter plus in grinding depth. These variations of coarse effect our pricing. We grind your tree stumps into usable mulch. Tree stump mulch is usually used to fill the hole left by grinding. Excess mulch is great organic material for your garden or compost bin, worms love it and it eventually breaks down to improve your soil and or keep the moisture in the ground. We have large and small machines which are capable of grinding any sized tree stump. The portable stump grinder can even be taken through your house or unit. Tree stump grinding is the most affordable method of removing tree stumps. 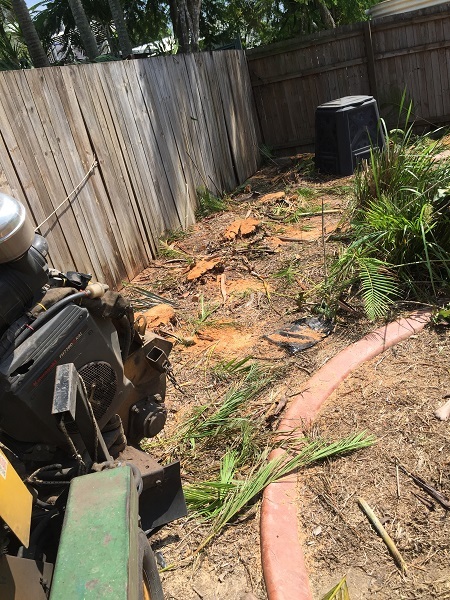 Depending on the situation, nearly complete stump removal is possible with a grinder. 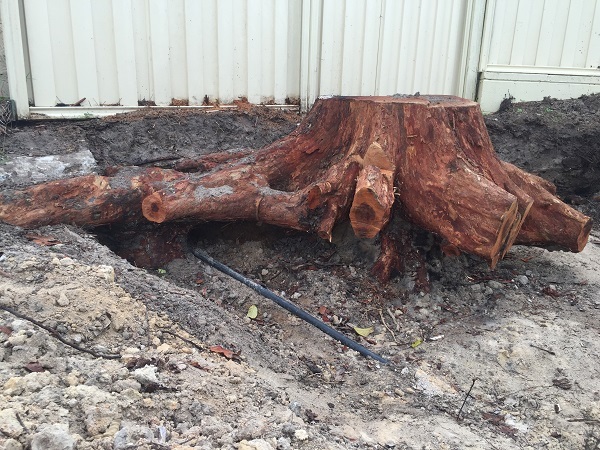 When you want your tree stump grinding job done properly in any Brisbane suburb, give us a call on 07 3279 6955. Grinding stumps in a Brisbane garden bed enables easy re planting. Grinding mulch adds more organic material which improves the soil, making plants happier. Customer tried digging out this gum stump, spending countless hours. Note the water pipe running under the buttress roots. Tree stump grinding is the most cost effective and efficient method for stump removal. Just Stump Grinding recommended by top notch arborist - and service clearly indicated why. Used their expertise twice and on both occasions a smooth, well oiled experience. From booking to conduct and completion of tasks both Brian and Brendan displayed great professionalism and knowledge of the requirements to provide me with just what I wanted. A fabulous service. Communication was good. Alan is obviously an experienced professional. He was easy to deal with and did a very thorough job. Highly recommended. We had Alan out this morning to grind two stumps behind our little unit - he was able to get the portable machine through our unit with no dramas, and the stumps were gone in less than ten minutes. They accept EFTPOS and cash, and are punctual, friendly, and very affordable. If you need stumps gone go with these guys. Thank you for the awesome job you did removing my bamboo. I was so impressed with Brendan's professional, friendly service and the extra care he took to preserve existing plants. Our reputation is based on thousands of happy satisfied Brisbane and Ipswich customers. 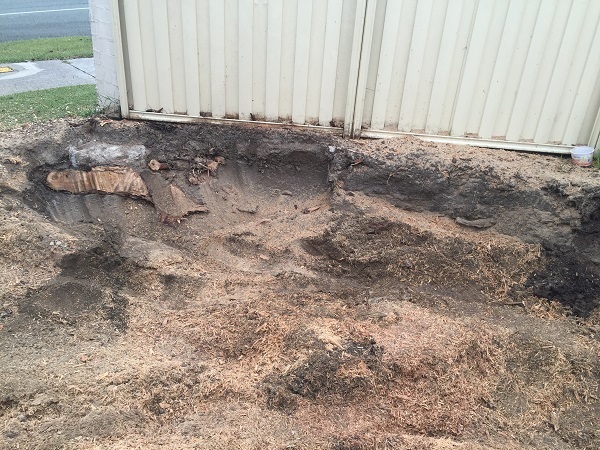 Tree stump grinding in Brisbane requires specialised equipment and the knowledge in how to use it properly. WE ARE YOUR BRISBANE STUMP GRINDER! Large and portable machines to access any tree stump. Our speciality is tree stump grinding; that's all we do. A term used to describe a method of removing a tree stump after the tree has been cut down. A cutting wheel fixed with tungsten teeth is used to chip and grind away the stump wood to below the surface of the ground.